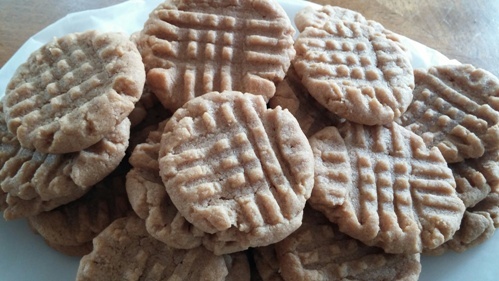 [The Cookie Elf File] 3 Ingredient Peanut Butter Cookies: Too Easy! 3 Ingredient Peanut Butter Cookies: Too Easy! 3 Ingredient Peanut Butter Cookies … it just doesn’t get any easier than this! Also known as “1-2-3 Peanut Butter Cookies,” this cookie recipe is simple and fast to put together. The ratio is always the same: 1-1-1 for cups of peanut butter to cups of sugar to eggs. The cookies are great for kids to make. Plus, they are naturally gluten-free. Think of it – you can bake homemade cookies even if you’re out of flour! Get the full recipe for 3 Ingredient Peanut Butter Cookies and some special baking tips from The Elf. Plus be sure to check out The Elf’s Peanut Butter Cookies Pinterest board for more cookie inspiration and fun!